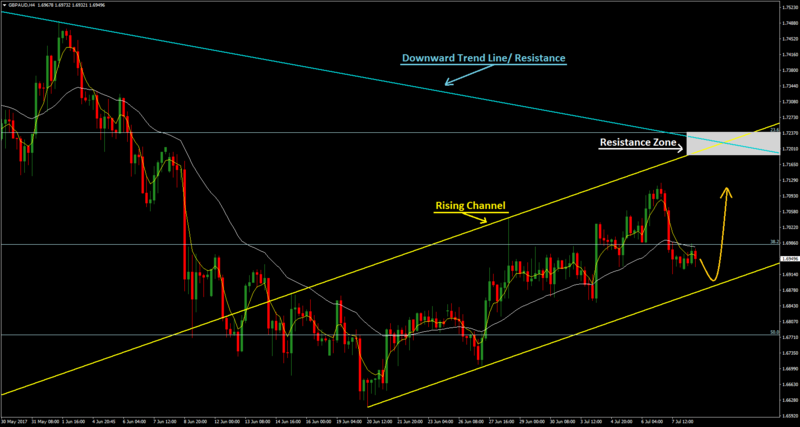 In H4 timeframe, GBPAUD is performing a recovery rally from June's low, while it is moving in a rising channel. If the formation is valid, then buyers will target the 1.72-1.724 resistance zone. On the other hand, if price violates the channel to the downwards, then the market may offer a decent opportunity to the sellers, targeting 1.677 level. Today's agenda hasn't any important news, but tomorrow, Tuesday, we are expecting National Australia Bank's Business Confidence (Jun) (Previous: 7), National Australia Bank's Business Conditions (Jun) (Previous: 12), Australian Investment Lending for Homes (May) (Previous: -2.3%), Australian Home Loans (May) (Previous: -1.9%/ Expected: 1.5%), UK Inflation Report Hearings and UK MPC Member Haldane Speech.